323 Beacon is located on the south side of Beacon, between Exeter and Fairfield, with 321 Beacon to the east and 325 Beacon to the west. 323 Beacon was designed by Frederick B. Pope and built in 1871-1872 by James P. Neal, mason, one of three identical houses (321-323-325 Beacon) built for Frederick B. Pope for speculative sale, and one of fourteen contiguous houses (303-305-307-309-311-313-315-317-319-321-323-325-327-329 Beacon) he designed and built in the early 1870s. Frederick Pope is shown as the architect and owner on the final building inspection report for all three houses, dated June 28, 1872. 321-323-325 Beacon – each 16 feet 8 inches wide – were built on two 25 foot wide lots. The eastern lot was owned by Frederick Pope and the western lot was owned by Augustus Napoleon Loring. The lots had been sold by the Commonwealth of Massachusetts at its public auction in December of 1870 and Frederick Pope and Augustus Loring either were the successful bidders or acquired the right to purchase the land from them. They did not take title to the property until June 28, 1872, the same day as the completed houses received their final inspection report. Frederick Pope then sold 321 Beacon and he and Augustus Loring sold 323 Beacon together. Augustus Loring retained 325 Beacon as rental property and then as his home. Click here for an index to the deeds for 323 Beacon. On October 1, 1872, 323 Beacon was purchased from Frederick Pope and Augustus Loring by Henry F. Mills. He and his wife, Annie Maria (Taylor) Mills, made it their home. They previously had lived in Cambrdge. Henry Mills was a barrel stave and heading dealer, in business with his brother, William F. Mills, who purchased 321 Beacon next door at the same time as Henry Mills purchased 323 Beacon. Henry and Annie Mills continued to live at 323 Beacon during the 1878-1879 winter season, but moved thereafter to Lexington. He continued to own 323 Beacon and lease it to others. During the 1879-1880 winter season, 323 Beacon was the home of Nathaniel Hugh Cotton and his wife, Harriet Emma (Clapp) Cotton. They had married in 1879, and 323 Beacon probably was their first home together. N. Hugh Cotton was a West Indies shipping merchant. By 1881, they had moved to 315 Walnut. During the 1880-1881 winter season, 323 Beacon was the home of Milton Clark, an insurance agent in partnership with his brother, Curtis Clark. He previously had lived at the Tremont House Hotel, and by 1882 was living at 15 Somerset. By the 1881-1882 winter season, 323 Beacon was the home of leather dealer Walter Irving Bigelow and his wife, Harriet Staples (Christian) Bigelow. They had lived at 254 Beacon during the previous season. On January 1, 1884, Henry Mills transferred 323 Beacon to his wife. They continued to live in Lexington. He died in December of 1888. 323 Beacon continued to be leased by Walter and Harriet Bigelow through the 1888-1889 winter season, after which they moved to an apartment in the Hotel Royal at 295-297 Beacon. By the 1889-1890 winter season, 323 Beacon appears to have become the home of Thomas Wentworth Peirce, a student at John P. Hopkinson’s college preparatory school at 29 Chestnut. He is listed as “T. W. Pierce” in the Blue Books from 1890 and as “Thomas W. Peirce, student,” in the City Directories for 1895 and 1896. Thomas Wentworth Peirce was the son of Thomas Wentworth Peirce, a shipping merchant and investor in Texas railroads and other businesses. He had died in October of 1885, and his nephew, also named Thomas Wentworth Peirce, became the executor and trustee of his uncle’s estate. The Peirces’ primary residence was in Topsfield, and the Peirce estate probably leased 323 Beacon so that the younger Thomas Peirce could be educated in Boston. By the 1892-1893 winter season, Thomas Peirce was joined at 323 Beacon by Miss Peirce, probably his sister, Marion Wentworth Peirce. They continued to live there until about 1896 (when Thomas Peirce entered Harvard). 323 Beacon was not listed in the 1897 and 1898 Blue Books. On April 8, 1898, 323 Beacon was purchased from Annie Mills by Dr. David Williams Cheever, a physician. He and his wife, Anna Caroline (Nichols) Cheever, lived at 557 Boylston. 323 Beacon became the home of the Cheevers’ son-in-law and daughter, Dr. George Shattuck Whiteside and Adeline Haven (Cheever) Whiteside, who married in October of 1898. 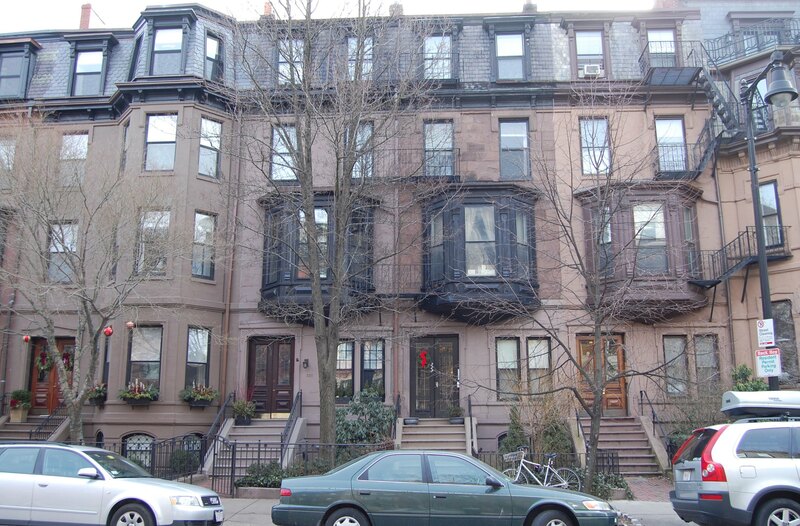 Prior to their marriage, he had lived at 6 Newbury and she had lived with her parents at 557 Boylston. George Whiteside was a physician and surgeon, and was assistant in anatomy at Harvard Medical School. They continued to live at 323 Beacon until 1904, when they moved to Oregon where he became an instructor in surgery at the University of Oregon. On August 15, 1904, 323 Beacon was purchased from David W. Cheever by Dr. Richard Goodwin Wadsworth, a physician. He and his wife, Mary Heath (Atkinson) Wadsworth, made it their home. 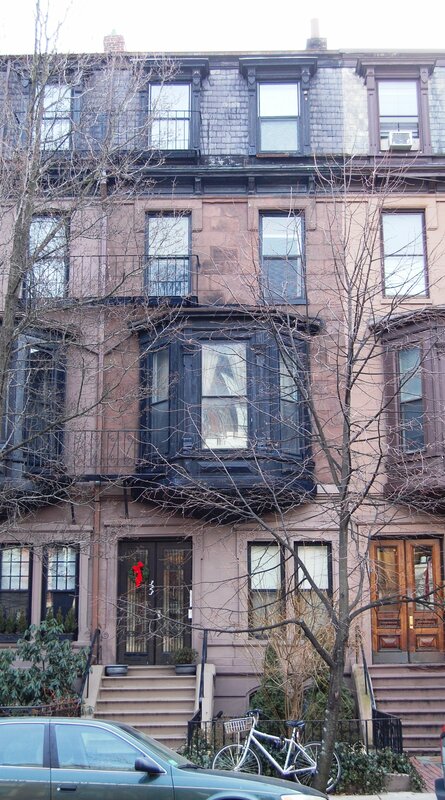 He maintained his medical offices both at 323 Beacon and at 65 Marlborough. They previously had lived (and he had maintained his medical office) at the Hotel Royal at 295-297 Beacon. On January 16, 1905, Richard Wadsworth transferred the property to his wife. The Wadsworths continued to live at 323 Beacon during the 1910-1911 winter season, but moved thereafter to West Roxbury. They continued to own 323 Beacon and lease it to others. During the 1911-1912 winter season, it was the home of Miss Edyth Deacon. She previously had lived at The Charlesgate at 535 Beacon and in Newport. Edyth Deacon moved from 323 Beacon by the 1912-1913 season, and by mid-1913 was living at 256 Beacon. By the 1912-1913 winter season, 323 Beacon was the home of attorney Alexander Whiteside, Jr., and his wife, Ethel (Stockton) Whiteside. They previously had lived at 192 Beacon with his widowed mother, Eleanor Anne Brune (Shattuck) Whiteside. Alexander Whiteside was the brother of George Shattuck Whiteside who had lived at 323 Beacon from 1898 until 1904. The Whitesides continued to live at 323 Beacon during the 1913-1914 season, but moved thereafter to 233 Beacon. By the 1914-1915 winter season, 323 Beacon was the home of Robert Amory, Jr., and his wife, and Leonore (Cobb) Amory. They previously had lived at The Stratford apartments at 31 Massachusetts Avenue. He was a textile manufacturing executive. Among their children was Cleveland Amory, born in September of 1917, an author and pioneer advocate for animal rights, whose works include The Proper Bostonians. The Amorys continued to live at 323 Beacon during the 1918-1919 winter season, but had moved to Milton by 1920. On April 22, 1919, 323 Beacon was acquired from Mary Wadsworth by Jasper Whiting. He and his wife, Marion McBurney (Schlesinger) Whiting, made it their home. During the 1917-1918 winter season, they had lived at 17 Exeter. A chemical engineer by training, Jasper Whiting was a chemical company executive and an inventor. Among his inventions were a process for making Portland cement from blast furnace slag and the “Whiting Cell” used in the manufacture of chlorine gas. 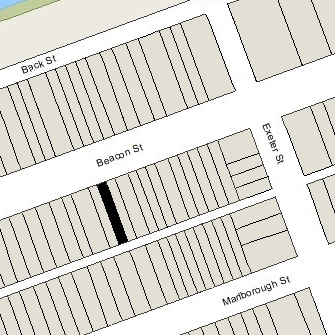 In July of 1919, he applied for a permit to construct a garage at the rear of 323 Beacon. He subsequently abandoned the permit. The Whitings continued to live at 323 Beacon in 1923, but were living elsewhere during the next three winter season. During the 1923-1924 and 1924-1925 winter seasons, it was the home of Albert Marshall Jones, a book publisher, and his wife, Grace (Webber) Jones. They previously had lived in Brookline. By 1926, they had moved to 2 Arlington. During the 1925-1926 winter season, 323 Beacon was the home of bond broker Henry Whitney Minot and his wife, Ellen Sears (Curtis) Minot. They previously had lived at 9 Lime. They had married in October of 1924; prior to their marriage, he had lived at 188 Marlborough with his widowed father, Dr. James Jackson Minot. In May of 1926 they purchased and subsequently moved to 108 Marlborough. The Whitings resumed living at 323 during the 1926-1927 winter season, but moved soon thereafter to Dover, New Hampshire. They continued to own 323 Beacon, leasing it to others, and it appears that, for several years, they may have retained an apartment at the house, inasmuch as Jasper Whiting continued to list it as his Boston address in the City Directories through 1929. By the 1927-1928 winter season, 323 Beacon was the home of Charles Brooks Perkins and his wife, Mary Louise (Floyd) Perkins. They previously had lived in an apartment at 100 Beacon. He was a tobacco dealer. They continued to live at 323 Beacon during the 1928-1929 season. By mid-1930, they were living at 116 Charles. 323 Beacon was not listed in the 1930-1931 Blue Books and was shown as vacant in the 1931 City Directory. By the 1931-1932 winter season, 323 Beacon was the home of Percy Musgrave, Jr., and his wife, Marguerite (Swann) Musgrave. They had married in October of 1931 and 323 Beacon probably was their first home together. Prior to their marriage, he had lived at 304 Marlborough with his widowed mother, Edith (Porter) Musgrave, and two unmarried aunts, Hortense and Rosamond Porter. Percy and Marguerite Musgrave also maintained a home in Stockbridge, Linwood House, which later became the Norman Rockwell Museum. They continued to live at 323 Beacon during the 1932-1933 season, but moved thereafter to Milton. During the 1933-1934 winter season, 323 Beacon was the home of George Upham Baylies, a salesman (and later sales manager) with the American Can Company, and his wife, Jacquelyn (Hartford) Baylies. They had married in November of 1933. and 323 Beacon probably was their first home together. Before their marriage, he had lived with his parents, Walter and Charlotte (Upham) Baylies, at 5 Commonwealth. By 1935, George and Jacquelyn Baylies had moved to an apartment in the Hotel Royal at 295-297 Beacon. By the 1934-1935 winter season, 323 Beacon was the home of Donald Carter Starr and his wife Ethel Randolph “Polly” (Thayer) Starr. They previously had lived at 29 Myrtle. Donald Starr was an attorney and avid sailor (he was the author of The Schooner Pilgrim’s Progress, A Voyage Around the World in 1932-1934), In the 1950s, he led efforts to create parks and lagoons at the banks of the Charles River in conjunction with construction of Storrow Drive. Polly (Thayer) Starr was a noted artist. The Starrs continued to live at 323 Beacon during the 1935-1936 season, but moved thereafter to 5 Otis Place. 323 Beacon was not listed in the 1937 Blue Book and was shown as vacant in the 1937-1939 City Directories. On October 24, 1939, 323 Beacon was acquired from Jasper Whiting by real estate dealer Henry Joseph O’Meara. On November 1, 1939. 323 Beacon was acquired from Henry J. O’Meara by Emma (Korb) Wolffers Feer, the wife of Max Feer, owner of a grocery and variety store. They previously had lived at 28 Blagden. They operated 323 Beacon as a lodging house. The Feers continued to live there in 1942, but had moved to 151 Beacon by 1943. On October 19, 1942, 323 Beacon was acquired from Emma Feer by Cornelius Sampson, a waiter, and his wife, Helen (Morley) Sampson. They previously lived in an apartment at 366 Commonwealth. In May of 1943, Helen Sampson applied for (and subsequently received) permission to convert 323 Beacon from a single-family dwelling into a lodging house. On September 27, 1943, 323 Beacon was acquired from the Sampsons by Mrs. Lillian Carmela (Barbanti) Luderer, former wife of Walter P. Luderer, who operated it as a lodging house. She continued to live there 1945, but moved thereafter to 527-529 Beacon. The property changed hands and on April 30,1956, was acquired by Jean A. Hoppe. In March of 1957, Jean Hoppe filed for (and subsequently received) permission to legalize the occupancy as a single-family dwelling and lodging house. The property changed hands, remaining a lodging house, and on December 29, 1961, was acquired by real estate dealers Jack Fay (Jacob Fagelman) and his brother, Irving Fay (Israel/Isidore Fagelman). On October 29, 1993, 323 Beacon was acquired from Jack Fay and Irving Fay by Patrick O’Byrne and his wife, Gloria O’Byrne. They continued to operate it as a lodging house. In May of 1997, the O’Byrnes applied for permission to convert the property from a lodging house into nine apartments, indicating that this was an existing condition inasmuch as there was a “cooking area” in each unit. The application was denied because of the small size of the units. In December of 2005, the O’Byrnes applied again for permission to convert the property from a lodging house into nine apartments, and their application was once again denied. Their appeal was dismissed by the Board of Appeal on November 28, 2006. On March 22, 2007, 323 Beacon was acquired from the O’Byrnes by the Reverso LLC (Vivian E. Shih and Mark C. Lu, managers of record). The legal occupancy of 323 Beacon remained a lodging house in 2016.